FreshDirect: Congratulations on winning Top Chef Masters! Tell me, what did you learn from that experience? 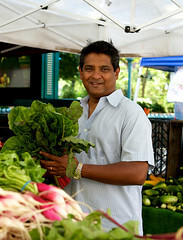 Floyd Cardoz: I learned that when I cook best when it’s for pleasure, with passion and from the heart. When I stay true to who I am, I made the best dishes. FD: That’s great advice for anything in life, right? A lot of people are afraid to cook or just don’t have the time for it. What’s your advice for them? FC: Keep it simple to get comfortable with cooking. Anyone can cook – from grilling peaches to sauteing onions and tomatoes to even frying an egg. Use simple recipes and don’t get too complex (Ed. note: like his watermelon salad recipe). FD: What should everyone have in their pantry? FC: I always have extra virgin olive oil, spices (like coriander, mustard, and black pepper), salt, vinegar, onions, ginger, garlic, good canned tomatoes, chicken stock and bacon on hand. Add in some seasonal vegetables and you can cook anything. FD: As a father, what advice do you have for other parents who want to cook for their kids? FC: Feed kids right. Don’t give in to fast food, but give them what they like to eat. If they like chicken nuggets, then make breaded baked chicken for them. I ask my kids what they would want to eat. My kids hated zucchini, but liked white beans. So I would make white beans with bacon (when all else fails, use bacon!) and add zucchini to the dish so they have to eat everything. On every plate, I have all of the food groups and I make sure there are vegetables of different textures. FD: What would your fans be surprised to learn about you? FC: I like to cook all types of cuisines, including Japanese food. My kids love sushi so I learned how to make it for them. I also love to go fishing so I always have fresh fish to use. FD: What do you think are the most overlooked foods? FC: Lesser cuts of meats like oxtail, lamb leg, shanks, short ribs, etc. Though they’re tougher cuts of meat and require patience, they’re worthwhile to use. Also chilies are often overlooked. There are so many varieties of chilies and the trick is to use chilies for flavoring, not just for heat. FD: You cook for everyone. Who do you wish would cook for you right now? FC: My late grandmother was the most phenomenal cook. When I was a child, I remember her making us baked beans with bacon and tomato, stews with dried shrimp, etc. FD: It’s great how you remember your grandmother’s beans and bacon and now you make similar dishes for your own kids! Thanks so much for chatting with me and taking the time to share with your FreshDirect fans. FC: Anytime! It was my pleasure. Check out all of Floyd’s Tabla meals here. And for readers in the NYC-area, look for his new restaurant, North End Grill, to open at the end of this year.